St. Francis is home now. 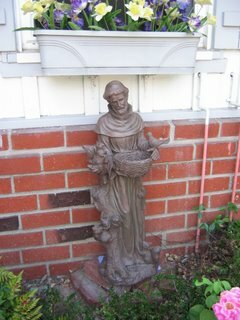 St. Francis has found a new home at our house. My grandmother had a devotion to St.Anthony and we had a cement St. Anthony in the same spot in the front yard since before I was born. Poor St. Anthony had seen better days. There was the abuse from the elements for the last 40 plus years, and then there was the time that I almost drove our old white van through the front of the house when I was learning to drive. 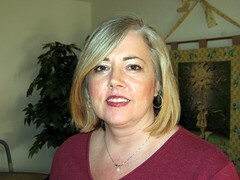 I drove up and over the brick of the flower bed and pinned St.Anthony against the house. I almost gave my poor Father a heart attack at the time too.... And then St.Anthony cracked in half and half of his face fell off. We were shopping with my brother today at a different Mall that we haven't been to in a long while and there was a cute indoor outdoor garden store there and in the front was this lovely statue. And it was on sale! Well, we just loved it and the people were really nice, they gave my mom and even better deal, wrapped it up and carried it out to the van with us. 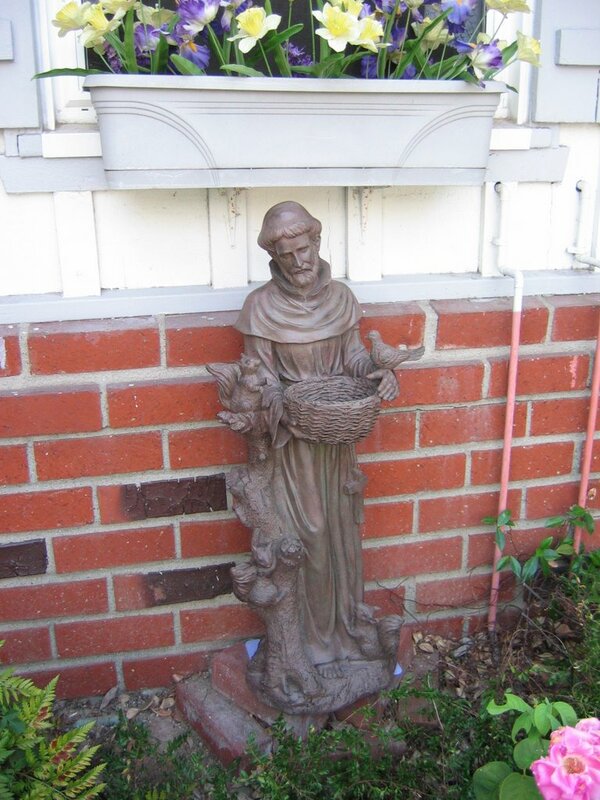 It's not St.Anthony, but we also like St.Francis and we just fell in love with this charming statue. We are going to put bird seed in the basket for the birds. St.Francis is known to be the patron Saint of the animals. I found an interesting biography of St. Francis' life if you are interested. After the mall we drove by my mom's work, she wanted to show us where she works. 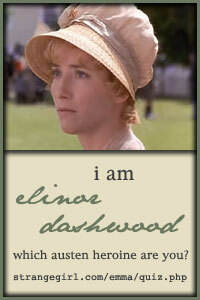 We cannot go in to the building because you have to have a security clearance to enter, but now we know where she is. And then we went by the cemetery, got flowers for Dad and went to see him. It's been muggy and threatening to rain since yesterday but the sun started to come out while we were there. My official license came in the mail today...woo hoo!! I'm so proud. I'm going to get a frame and display it proudly in my office.